Forget everything you know about Indian food when you step into Tumbi. On a trendy stretch of Santa Monica Boulevard, where a common Indian restaurant would not survive the what’s-next Westsider crowd, this upscale craft Indian kitchen is bustling, even on a typically slow week night. 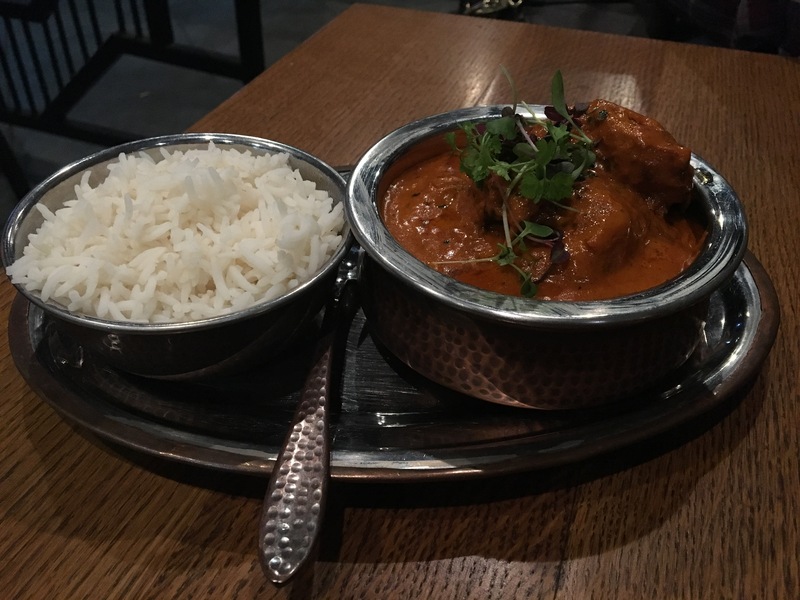 Certainly, the food itself is an allure, but the cool ambiance and outstanding service at this Santa Monica Indian eatery round out an excellent dining experience. 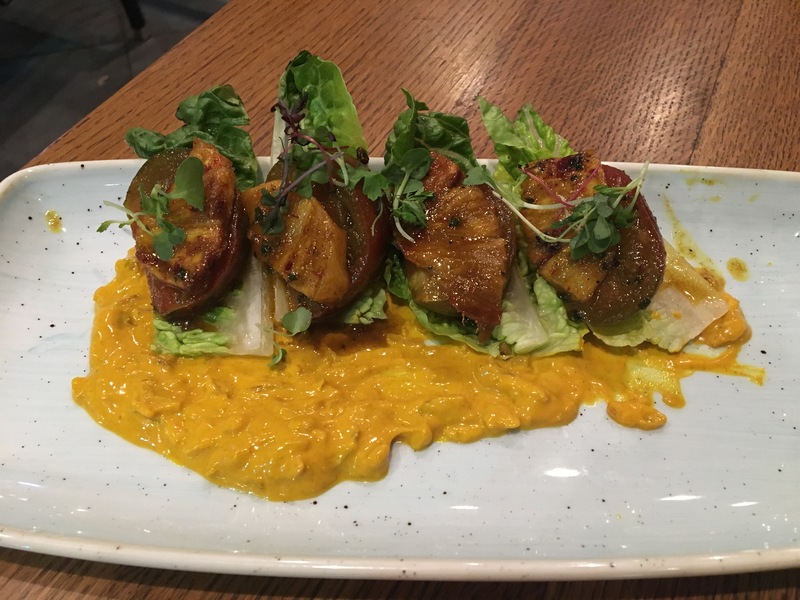 Chef Imran Ali Mookhi’s modern twist on Indian faire is inventive and daring, but of course first you must figure out what to order on a menu that seems exotic even to Indian food fans. Luckily, the serving staff is eager to help. 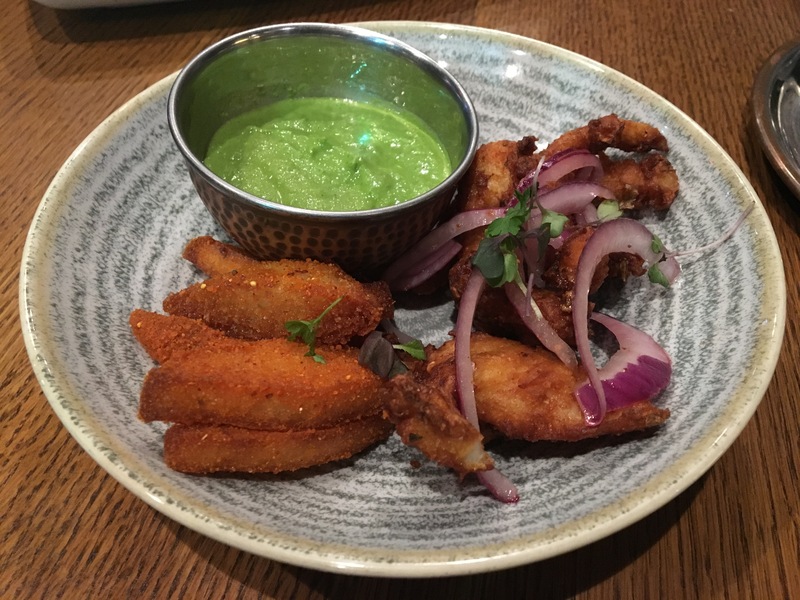 As our server was quick to note, Tumbi is unlike any other Indian restaurant. 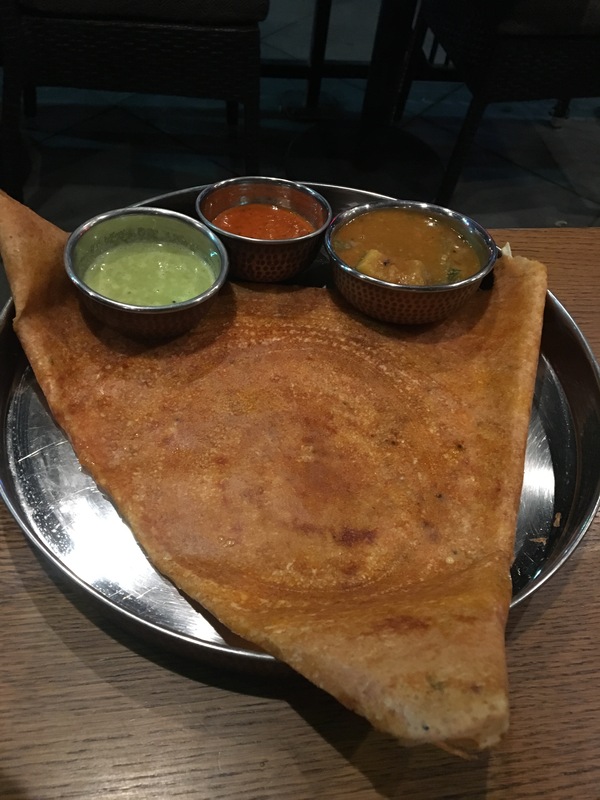 The menu is a mix of Indian gourmet foods and traditional street food, organized in categories equivalent to appetizers, entrees, and sides, listed as Start, Street, Tandoor, Dosa, Pot, and Side. With a quick primer, we learned that on average people order about five different items from the menu to share. Even for someone like myself who is intimidated by Indian food, due to my lack of knowledge about it, the server’s enthusiasm and warm manner was inviting, and her descriptions of the food and its preparation made the menu intriguing yet accessible. When the chef learned I was a newcomer to Indian cuisine, he came out to give his recommendations. We started with a bursting-with-freshness heirloom tomato and caramelized pineapple salad with turmeric yogurt and mustard oil. This we enjoyed with a side of garlic naan. 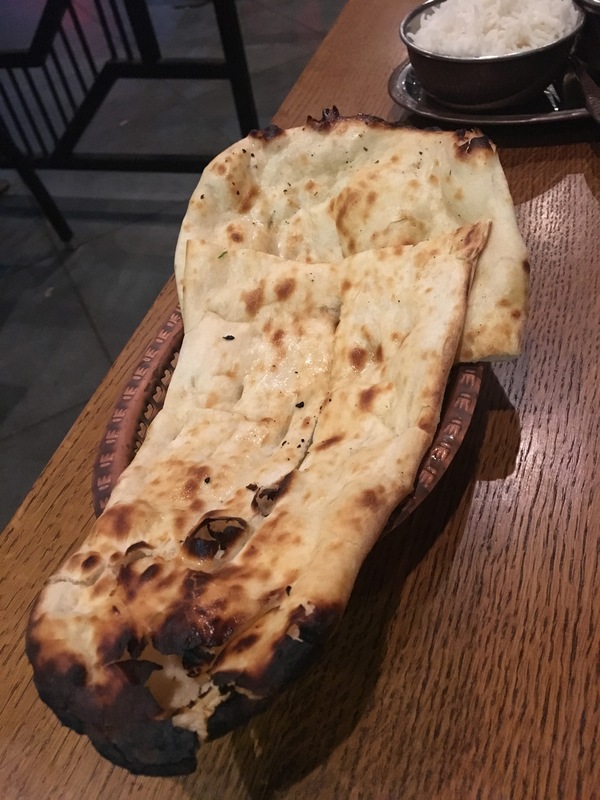 Our server relayed that the nanna bread here is known as “phenomenal,” in varieties of traditional, garlic, and malai. We followed with a signature dish called Butter Chicken, figuring you can’t go wrong with any dish with both ‘butter’ and ‘chicken’ in the name. The savory boneless leg meat is simmered for 10 hours in a in mildly spicy tomato curry sauce, which adds to the rich vegetable flavor. The laborious process to cook this dish was well worth trouble. 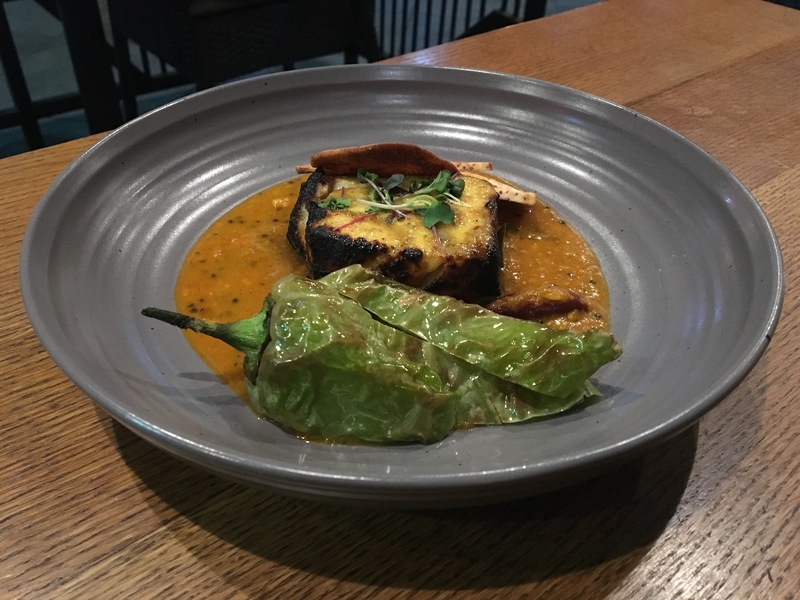 Next we had Apricot Curry Patagonian Toothfish Masala – a soft and flakey seabass steak, which was cooked in the tandoor Indian clay oven. This method cooks the fish at a high heat, with the fat dripping onto the coals at temperatures of up to 900 degrees Fahrenheit, preserving the juices and sealing in the flavor. Again, the means were worth the end result. This fish steak was delectable. From the Street category, we munched on the Vada Pav & Ildi Fries, which are spiced potato patties with gun-powder seared pav bread, along with rice fries, which are sticks of steamed rice that is breaded and deep fried into satisfyingly crispy treats. 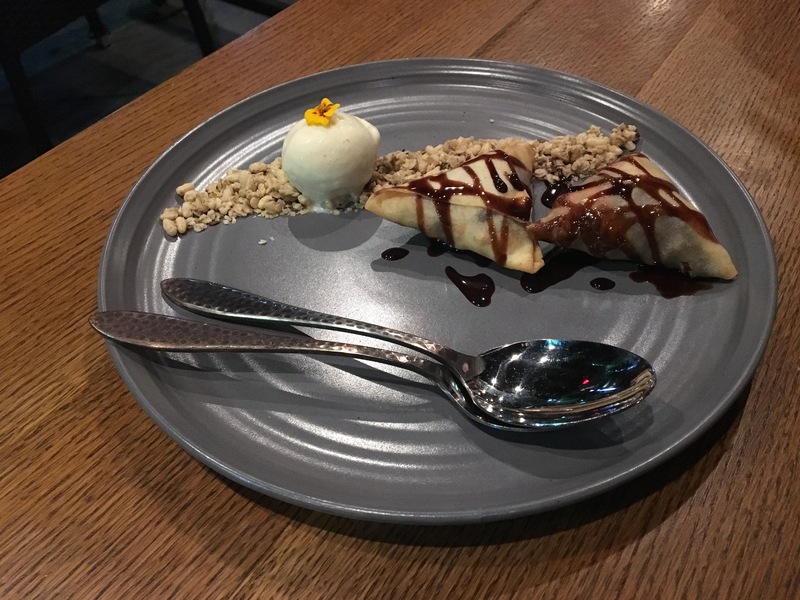 We wrapped up our meal with a delicious crunchy empanada-style dessert, a hard-shelled pastry filled with sweets and nuts and drizzled in chocolate and served with a small dollop of barfi Indian ice cream. All the courses were presented with artistry that matched the extravagant flavors and spices, inspired by tastes from Rajasthan, New Delhi, Goa, Chennai, Afghanistan and Pakistan. Tumbi is a hot mix of authentic street food with Indian haute cuisine, with a laid-back chic vibe that makes an Indian food newbie’s epicurean journey across India an inviting experience. If Tumbi – named after an Indian musical instrument – is the music of Indian food, play on.